If you drink several cups of tea per day, you may be concerned about the effects of the caffeine in your tea. A glass of iced tea on a hot day can help you cool down and will give you a boost of caffeine when you don't want a hot beverage. Caffeine, whether in tea, coffee or soft drinks, is one of the most commonly consumed drugs. Caffeine is a well-known neurological stimulant. Many people consume caffeine to wake up in the morning and to remain alert during tasks that require concentration, such as studying or driving. It is used medicinally as a muscle relaxant to treat migraine headaches and asthma. It is also a mild diuretic, which has prompted the assumption that caffeine can cause dehydration. Black tea contains between 40 and 120 mg of caffeine per 8-oz. cup. The wide variation is due to differences in brewing times. The longer you let the tea steep, the more caffeine will be extracted from the tea leaves. Decaffeinated black tea does contain some caffeine. A cup of decaffeinated tea contains between 2 and 10 mg of caffeine. Unlike black tea, green tea is not fermented prior to drying. It contains between 60 and 100 mg of caffeine per 8-oz. cup. Pre-made green teas vary widely in the amount of caffeine they contain. Arizona brand iced green tea, for example, contains only 15 mg of caffeine per 16-oz. serving. Herbal teas are not made from the leaves of the tea plant and do not contain caffeine. Instead, they are infusions of leaves and flowers from a variety of plants such as chamomile, raspberry or mint. Herbal teas are a good way to stay hydrated. According to guidelines published by the South Dakota Department of Health, caffeine is safe in moderate amounts. It is recommended that you limit your caffeine intake to 300 mg or less per day. More than this can cause headaches, stomachaches and insomnia. The effects of caffeine can last for several hours, so keep this in mind if you are considering a late afternoon cup of tea. According to Balz Frei, Ph.D., director of the Linus Pauling Institute at Oregon State University, moderate amounts of caffeine — up to 500 mg per day — do not cause dehydration. 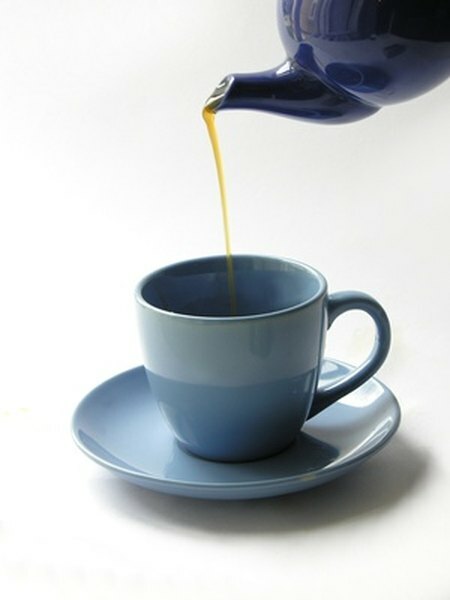 The liquid content of tea compensates for the diuretic effect of the caffeine. Linus Pauling Institute: The Beverage Guidelines: What Should You Drink to Stay Healthy?